Preliminary ProceduresRemove the air cleaner assembly. Refer toAir Cleaner Assembly Replacement.Install engine support fixture. Refer toEngine Support Fixture.If equipped with LAU, reposition the power steering reservoiroutlet hose. Refer toPower Steering Fluid Reservoir Outlet Hose Replacement.If equipped with LAU, remove the radiator inlet hose. RefertoRadiator Inlet Hose Replacement.Prior to removing the mount, mark the mount location usingspray paint or a marker for correct positioning duringinstallation. 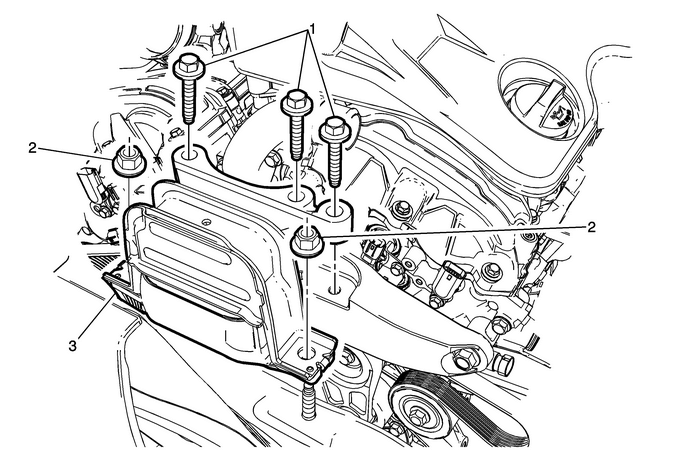 If all powertrain mounts are replaced, perform“Powertrain Mount Balancing”. Refer to theappropriate engine section.